Palo Cedro Feed is a 3rd generation family owned & operated feed store business located in Palo Cedro, a few miles West of Redding. 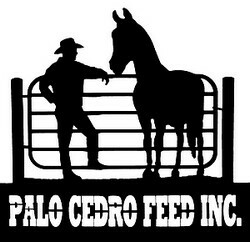 Palo Cedro Feed deals in all aspects of Feed, Hay, Tack, Fencing, Gates, Stock Tanks and miscellaneous supplies. But their inventory doesn’t stop there! You’ll find unique bird houses, jewelry, gift items, horse blankets, show and grooming supplies and more! Their friendly staff is helpful and knowledgeable, ready to answer any questions you may have. Come in to Palo Cedro Feed! You’ll find the best in feed products and animal care products. If they don’t have it, they can usually get it!